Dr. Mey Nevo graduated from the University of Illinois College of Veterinary medicine in May 2007. She has had the opportunity to practice veterinary medicine in Illinois, Tennessee, New Jersey, and Minnesota while following her husband through his Small Animal Internal Medicine internship and residency. They finally settled down here in Minnesota to be closer to family. Dr. Nevo shares her life with her wonderful husband Dr. Steven Shadwick, her 5-year-old daughter Sophie, her 3 year-old son, Robert and her 6 month-old baby girl, Lucy. “These three little ones offer new and exciting challenges on a daily basis”. Her household also includes two dogs: Neah, a 12-year-old German Shepherd; and Scout, a 10-year-old Blue Healer mix. The Nevo-Shadwicks are also privileged enough to be allowed to share a home with a 16-year-old cat Dublin who manages to keep the entire family in line. As you can guess it is very busy these days at the Nevo-Shadwick household!! Dr. Nevo is passionate about bringing a personal touch to her patient care. She has attended additional training in veterinary ultrasonography and has been integrating this imaging modality to her diagnostic repertoire on a daily basis since 2008. Dr. Nevo’s extensive ultrasound training has allowed her to bring advanced diagnostics to her clients at an affordable rate. In addition to advanced imaging techniques, Dr. Nevo’s interests include soft-tissue surgery and internal medicine. Dr. Jennifer Blum graduated from the University of Wisconsin-Madison College of Veterinary Medicine in May 2006. After graduation Dr. Blum and her husband, Charles, moved to the Mile-High City to experience the majestic Rockies first hand. One of Dr. Blum’s favorite quote: “Home is where your story begins” became a constant reminder of the distance from her family, and after a year they realized they needed to move back home. Dr. Blum currently lives with her loving husband, Charles and her adorable 7-year-old twin girls, Ava and Allison. Her family also consists of a few furry friends including, a free-willed Labrador retriever, Eddy, and twin mini lop rabbits, Cotton Candy and Lollipop. Dr. Blum truly cares about finding a balance between eastern and western medicine to offer a well-rounded treatment plan and wide range of care options for her patients. Her professional interests include dentistry, internal medicine, and integrative medicine. Dr. Blum is certified in Veterinary Acupuncture and is also well versed in advanced dental procedures. Dr. Griffin joined Carver Lake’s team of veterinarians after earning her degree from the University of Minnesota College of Veterinary Medicine in 2007. Prior to that she worked in retail management, insurance claims, and in research at Fort Dodge Animal Health. Her undergraduate degree is in Biology/Environmental Studies from Concordia in Moorhead MN. Go Cobbers! During Vet. School Dr. Griffin was active in many student organizations and frequently received awards and scholarships for her hard work and dedication to the field. When Dr. Kelly Griffin is not at Carver Lake she can be found spending time with her husband, their five children, and their yellow lab Gunner. They enjoy camping, playing soccer, or taking in a drive-in movie. When she is lucky she can be found enjoying a Twins game or watching Gopher vs. Iowa Football. Dr. Chris Ed graduated from the University of Illinois in 2009 and joined Carver Lake’s team shortly after that. He has a Bachelors and Masters of Science in Biomechanics from the University of Illinois as well. His prior experience was in the Information Technology Field. When he isn’t caring for animals at the clinic he enjoys spending time relaxing with his wife, their children, and of course their pets, a Miniature Pinscher, Toby and a silly cat, Cici. He enjoys spending time outdoors jogging, hiking, fishing, and skiing. Dr. Maddox is originally from Atlanta, Ga. and joined the veterinarians at Carver Lake in 2015. After receiving her undergraduate degree in zoology, she took a break from school, working extensively as a veterinary technician, attending art school for photography and drawing, became a video editor, and volunteered frequently with local wildlife facilities. In 2009, she applied and was accepted into the University of Minnesota’s College of Veterinary Medicine, graduating in 2013. Since then, she has worked in small animal practice and particularly enjoys rabbits and other small exotic pets. She continues to volunteer frequently, spending time with the Minnesota Companion Rabbit Society and the Wildlife Rehabilitation Center as a veterinarian and in various other capacities. She has an interest in animal behavior as well and enjoys helping families discover ways to train and improve the bond with their furry family member. Outside of the clinic, Dr. Maddox enjoys a number of creative pursuits: ceramics, drawing, sewing and other crafts, camping, hiking and spending time with her husband and their son, Parker. Their small menagerie consists of 2 dogs: Bentley, the Saint Bernard and Winston, a rescued bull mastiff cross, 2 rabbits: Elliott, the Flemish Giant, and Angus the English Lop, with a few fish thrown in for good measure! Jessica received her AAS in Veterinary Technology from Argosy University in 2002. Shortly after graduation she started at Carver Lake. Jessica has always had a passion for rehabilitating animals and enjoys educating the public on proper pet care. Another favorite part of her job is helping owners of senior pets navigate the day to day challenges they face. When Jessica isn’t at the clinic she spends her time “Up North” hanging out in the great outdoors with her family, and spoiling her two sweet kittens; Nibbler and Go.T. April attended Globe College and obtained her AAS in Veterinary Technology in 2005. She joined Carver Lake’s team in December of 2007. April has always had a love of animals and an interest in veterinary medicine, and strives to create lasting bonds with clients. She especially enjoys watching our patients grow from babies into their senior years. She believes it’s important to build trust and provide clients with valuable health care education so they can keep their pets happy and healthy. When not at the clinic April enjoyes hiking with her husband, their three daughers, and their Labrador, Bo. They have a love of nature and value the educational experience it provides for their kids. Their goal is to explore as many National, State, and Local parks as possible! 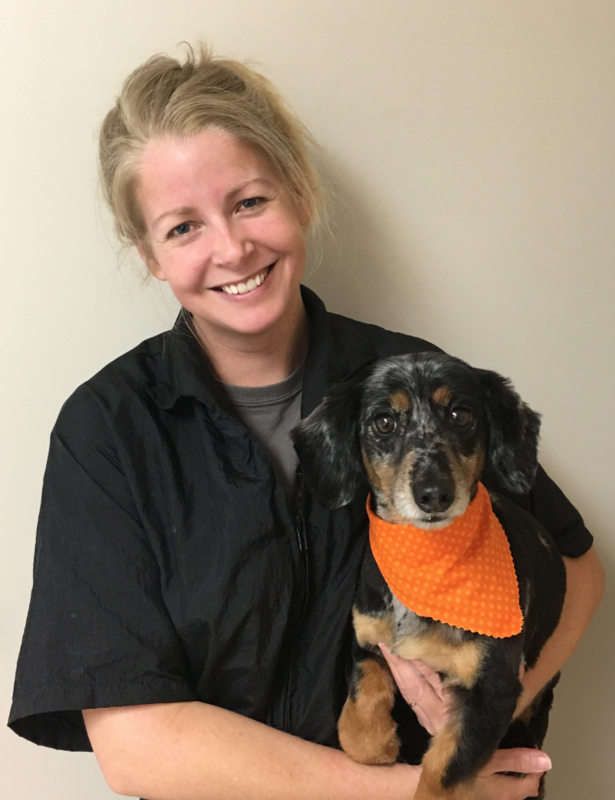 Sarah became a CVT in 2009, and after working in other veterinary clinics for four years, she came to call Carver Lake Veterinary Center her home in 2014. Sarah has always loved animals, attending many “animal camps” as a child. That love of animals developed into her career and she has since found a special passion for internal medicine and caring for geriatric patients. Sarah owns a Boston Terrier named Leo, a French Bulldog named Sheldon, and a cat named Jynx. She enjoys the family life with her husband and daughters, Vaeda, Novalee, & Mira and says there is nothing better than rediscovering the world through the eyes of her children! Niki joined our team in 2016, but has been a Veterinary Technician for many years. She loves every aspect of veterinary medicine, but has a special interest in canine behavior. One of her favorite parts of the her job is helping clients through challenging behavioral issues. She finds it very rewarding to know that she has helped strengthen the bond between an owner and their pet. Niki’s love of pets and canine behavior is certainly evident in her life outside of Carver Lake Veterinary Center as well! She is extremely active with her seven (yes seven!) Australian Shepherds, participating in obedience, agility, and herding classes & competitions. She even teaches many of these classes! We should mention that Niki also has a cat that rules all the dogs. Ashley joined our team in 2016 after receiving her Bachelors in sociology from Bethel University in 2007 and her Associates in Veterinary Technology from Argosy 2010. In addition to working with companion animals, Ashley has also worked with zoo animals at a tiger sanctuary and also a zoo in Tyler Texas. Through these jobs, she learned to love using positive based training. In fact, she used clicker training with many of the tigers and African serval cats! Ashley has a papillon named Jasper and a working police german shepherd named Kilo, who serves with Ashley’s husband on the police force! Kilo is the second police dog Ashley and her husband have raised and trained together! They also have a son named Connor, who keeps them very busy! In her spare time, Ashley likes to spend time with family, read, go to amusement parks, hike, shop, travel, and watch cooking shows. Amanda completed her degree in Veterinary Technology at Globe College in 2005, and joined our team in 2016. Although she loves all aspects of veterinary medicine, she finds assisting in surgery and connecting with pet owners to be her favorite parts. When she’s not at the clinic, Amanda keeps busy with her husband and their two boys, Tyler and Jackson, along with their Pitbull, Juniper, and cats, Milo and Yoda. They are an adventurous family and love the outdoors….so much so, that Amanda and her husband went cliff jumping after their wedding, wedding dress and all! Paula joined our team in 2017 shortly after completing her degree in veterinary technology. Having spent some of her training working in labs, Paula was thrilled to get a chance to work directly with pet owners and states that one of her favorite things about her career choice is helping pets by helping their owners through client education. When not at the clinic, Paula enjoys spending time with her own crew of creatures; Kira the Lab, Buttons the Papillion, Ferdinand the cat, and Gearge Clooney the rat. Kayla just recently joined our clinic in August of 2018. She graduated at Minnesota State, Mankato with a bachelor’s degree in Zoology and pre-veterinary sciences with the aspiration of one day making it into veterinary school. She finds our outstanding staff very admirable and enjoys learning all she can in order to achieve her goals. Always having a passion for animals, Kayla now lives with her boyfriend of 9 years, R.J., and just recently adopted a new puppy named Rin. She also has a 4 year old kitty named Tink who she picked up off the streets at just a few months old. She enjoys spending time at the dog park with her puppy to play with her mother and sister’s dogs. But she also enjoys relaxing at home with her kitty. Her other hobbies include drawing, playing games with friends, and going to music and renaissance festivals. I started simply, washing dogs for a local grooming salon and then moving on to an apprenticeship. Under the guidance of an amazing Master groomer I found my niche. With my God-given artistic strengths and love of all things furry, grooming was it! Work really doesn’t seem like “work” when you are passionate about it. For the last 18 years I’ve challenged myself to improve- not only in technical skills, but to also give the best care to each pet that I have the pleasure of working with. They are all such unique individuals, and I love figuring out their personality traits and quirks. I value having a trusting relationship with both pet and pet parent. It hands-down just makes my day if I can put a smile on someone’s face when they get to see their freshly groomed family member. I am glad to be part of the staff here at Carver Lake!